If you had the choice, you'd probably opt out of being mauled by a mountain lion. But look, sometimes you don't get the choice, so when the time comes are you going to kill that mountain lion with your bare hands, or not? Honestly, probably not. But this guy did. On Monday afternoon, a trail runner was out in the Horsetooth Mountain Open Space area outside of Fort Collins, Colorado. And he was attacked by a mountain lion. For a lot of people, that story, and their story, would end there. The man heard something behind him, and just as he turned the mountain lion began to bite his face and wrists. And then he choked it to death. After additional investigation, including examination of the lion, we have confirmed the victim's account that he was able to suffocate the animal while defending himself from the attack. We're just gonna say it again: He choked a mountain lion to death. According to a news release from Colorado Parks & Wildlife, he had “serious, but non-life threatening injuries” but was well enough to run out of the park and made it to the hospital. 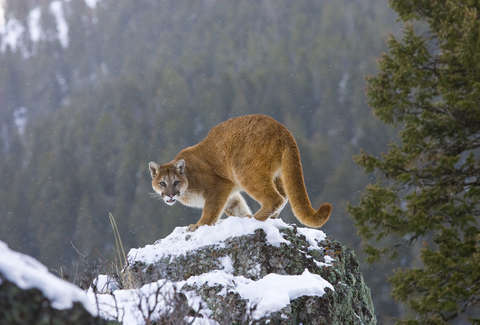 It was confirmed that the 80-pound juvenile cougar was indeed suffocated to death. “The runner did everything he could to save his life. In the event of a lion attack you need to do anything in your power to fight back just as this gentleman did,” said Mark Leslie, Colorado Parks and Wildlife Northeast Region manager in the release.